Moree is a large town in Moree Plains Shire in northern New South Wales, Australia. On the 31st (Wed), take in the dramatic natural features at Waa Gorge and then take in the exciting artwork at Bank Art Museum Moree. To see traveler tips, maps, ratings, and more tourist information, read our Moree itinerary maker app . Albury to Moree is an approximately 6-hour flight. You can also drive. Traveling from Albury in July, expect nights in Moree to be about the same, around 5°C, while days are a bit warmer, around 20°C. You'll set off for Noosa on the 1st (Thu). Popular historic sites such as Chenrezig Institute and Sunshine Castle are in your itinerary. Get some cultural insight at Hastings Street and Mapleton Observatory. Explore Noosa's surroundings by going to Maleny (Maleny Botanic Gardens & Bird World, McCarthy's Lookout, & more), Buderim (Atrium Gallery at Buderim Craft Cottage, Pioneer Cottage Buderim, & more) and Caloundra (Queensland Air Museum, Seaview Art Gallery, & more). 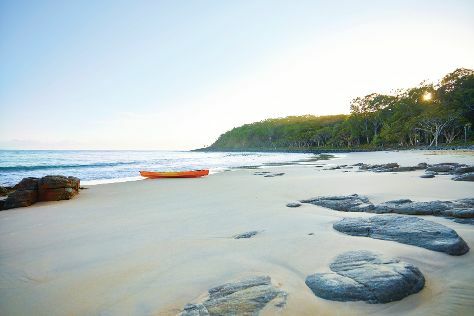 Spend the 2nd (Fri) exploring nature at Noosa National Park. The adventure continues: visit a coastal fixture at Caloundra Lighthouses, make a splash at Sea Life Sunshine Coast, learn about all things military at Noosa Museum, and see the interesting displays at Yandina Historic House. To see photos, reviews, traveler tips, and other tourist information, read Noosa itinerary planning site . Use the Route module to find suitable travel options from Moree to Noosa. Finish your sightseeing early on the 12th (Mon) so you can travel back home.